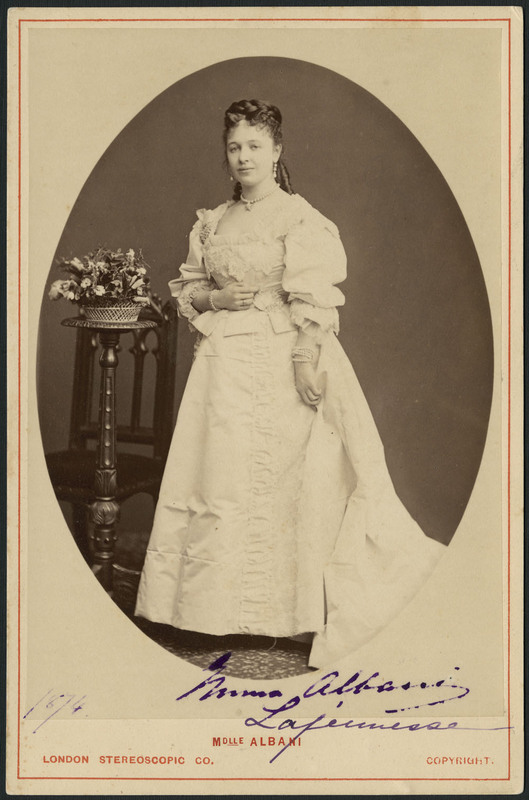 LAJEUNESSE, EMMA (also called Marie-Louise-Cécile-Emma) (Gye), known as Emma Albani, singer, pianist, harpist, and teacher; b. 1 Nov. 1847 in Chambly, Lower Canada, daughter of Joseph Lajeunesse, a music teacher, and Mélina Mignault; m. 6 Aug. 1878 Ernest Gye in London, England, and they had one son; d. there 3 April 1930. Emma Lajeunesse’s parents were musicians who recognized their daughter’s exceptional talent very early in her life. Her mother first taught her to play the piano, but it was her father, a pianist, harpist, organist, and violinist, who saw to it that she received a full musical education. After his wife’s death in 1856, Joseph Lajeunesse was hired to teach music at the convent of the Religious of the Sacred Heart in Sault-au-Récollet (Montreal), where his daughters Emma and Cornélia (also called Nellie) enrolled as boarders and received a sound general education. Attending from 1858 to 1865, Emma reportedly had Charles-Gustave Smith* as one of her teachers there. Both girls were musicians and occasionally performed in public. Emma, who sang, composed, and played the piano and harp, gave her first concert on 15 Sept. 1856 at the Mechanics’ Institute in Montreal. She was eight years old, and the critics marvelled at this child, recognizing her as a prodigy. 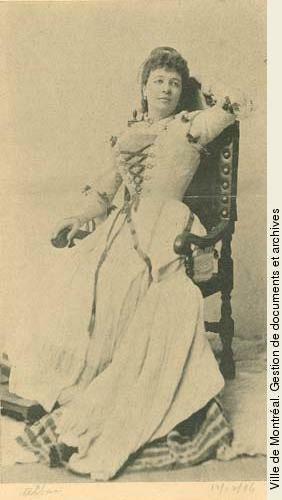 On 16 Sept. 1862, the day after another concert that the now 14-year-old Emma gave at the same place, La Minerve described her voice as “sent from heaven.” She also sang in Chambly, Saint-Jean (Saint-Jean-sur-Richelieu), L’Assomption, Sorel, Industrie (Joliette), and Terrebonne. Joseph Lajeunesse was aware of Emma’s exceptional talent and sought to encourage it. He tried to raise enough money to send her for studies in Paris. Faced with an indifferent community uninterested in the development of musical talent, he left Montreal, probably in 1865, and set out with his family for New York State, stopping at several towns, including Saratoga Springs and Johnstown, where his daughters performed. 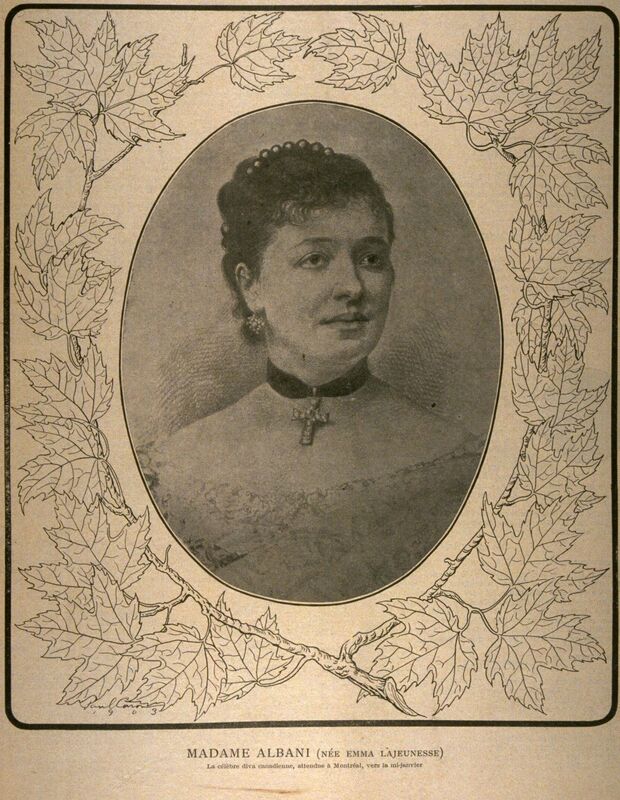 In Albany, Emma was hired as soloist for the parish church of St Joseph, where for three years she sang, played the organ, and directed the choir. She also worked at composing vocal scores, as well as pieces for solo piano, two pianos, and harp. 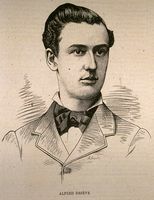 In 1868, with her father’s savings, the encouragement of Bishop John J. Conroy of Albany, and financial assistance from the parishioners, Emma was able to go to Paris, where she studied singing with Gilbert-Louis Duprez, the famous French tenor, who created the role of Edgardo in Donizetti’s Lucia di Lammermoor. Not long after her lessons with him began, Duprez is said to have remarked about Emma, “She has a beautiful voice and ardour. She is of the kind of wood from which fine flutes are made.” Unfortunately, he fell ill a few months later, and Emma continued her studies for a year in Milan, Italy, with the eminent voice teacher Francesco Lamperti. The solid technique she learned from him, along with her rigid discipline, kept her in good vocal health and enabled her to alternate between light and dramatic roles for many years. Soon short of money, Emma went looking for work, and thus obtained her first engagements in Messina during the 1869–70 season. She sang the roles of Oscar in Verdi’s Un ballo in maschera, Amina in Bellini’s La Sonnambula (her lucky role), and Alina in Donizetti’s Alina, regina di Golconda. It was the custom in operatic circles for singers to adopt stage names. Emma unhesitatingly followed the advice of her elocution teacher, Delorenzi, and took the stage name of Albani for her Italian debut, thereby perpetuating the name of an old Italian family of which only one member was still alive. From the time of her debut in Messina, she realized that to portray historical characters, it was not enough to sing well. To broaden her cultural awareness, she visited museums and read widely. Her first brilliant successes gave her an entrée to theatres in Florence, Italy, in Malta, and in London. 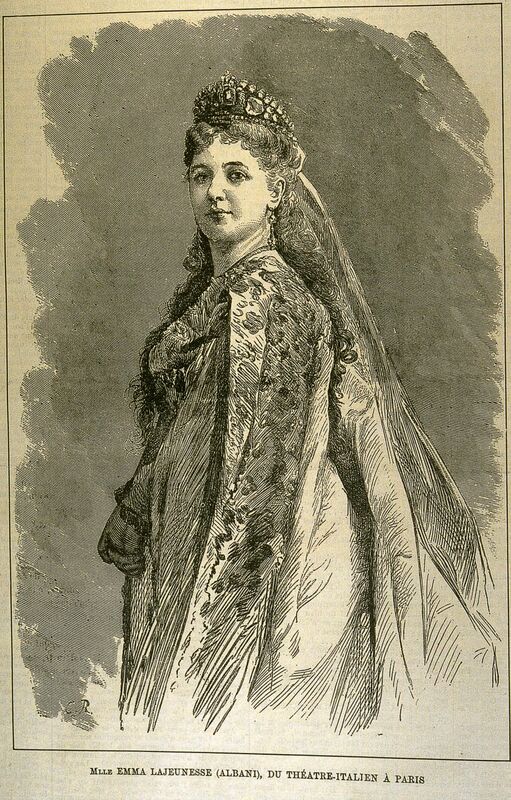 Albani had her first engagement at the Royal Italian Opera – the name taken in 1847 by Covent Garden in London – on 2 April 1872, and was a great success in the role of Amina. 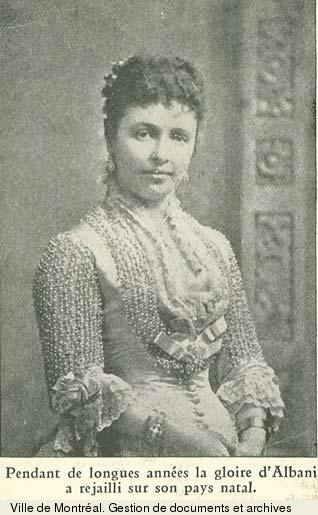 She was the first Canadian woman to perform in this prestigious opera house and would remain with it until 1896. Albani’s London debut launched her firmly on her career. From then on she was in demand by the most famous theatres in Europe and North America. London, Paris, Berlin, Vienna, Brussels, Venice, New York, Moscow, St Petersburg, and other cities welcomed and applauded her. Her light voice, her stage presence, her mastery of mezza voce, her perfect technique, and her ability to trill (Lamperti reportedly even dedicated a treatise on the art of trilling to her) made her the ideal interpreter of bel canto, which then held sway in opera houses. As time went on, she would develop a fuller and more robust chest voice, enabling her to sing more dramatic roles. The Sicilians nicknamed her “Bellini’s daughter” for her performances of that composer’s works. Her repertoire included Amina in La Sonnambula and Elvira in I Puritani by Bellini, Lucia in Lucia di Lammermoor and Linda in Linda di Chamounix by Donizetti, Gilda in Verdi’s Rigoletto, and Rosina in Rossini’s Il Barbiere di Siviglia. She was tall and slender, with blue eyes and a pale complexion, and the critics emphasized her serenity and her exceptional powers of concentration. In the 1870s Albani went to Moscow and St Petersburg, where she sang in the Alexander theatre in the presence of Tsar Alexander II of Russia. 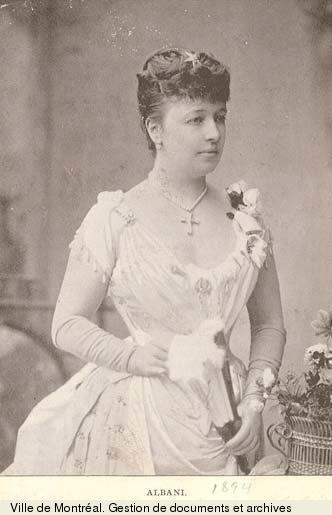 In 1874, a memorable years for the singer, she was honoured with an invitation to Windsor Castle to give a private recital for Queen Victoria. This was the first of a series of occasions on which Albani would perform for reigning monarchs, but it was also the beginning of a friendship between the two women, who would visit each other regularly until Victoria’s death in 1901. Albani would even sing at the funeral of the monarch, whose diary contains references to the singer’s dignified bearing, friendliness, and kindness. In November 1874 Albani went on tour in the United States, where she performed her first Wagnerian role – Elsa in Lohengrin – at the Academy of Music in New York. A role she created at the Royal Italian Opera the following year, it brought her one of her greatest triumphs. Year by year her repertoire grew. She played Lady Harriet in Flotow’s Martha, Juliette in Gounod’s Roméo et Juliette, Inès in Meyerbeer’s L’Africaine, Ophélie in Thomas’s Hamlet, and Mignon in Mignon by the same composer, and she took Wagnerian roles such as Eva in Die Meistersinger von Nürnberg, Senta in Der fliegende Holländer, Elisabeth in Tannhäuser, and Isolde in Tristan und Isolde. During the final years of the century the glory of bel canto faded and new styles emerged, including that of performing operas in their original languages rather than, as previously, in Italian. Albani did not resist this change and would sing Wagner in German – not surprising for a multilingual perfectionist who spoke French, English, Italian, and German. Beyond the confines of Germany, she became one of the most sought-after Wagnerian performers of her time. From the beginning Albani’s career was marked by privileged meetings and friendships. In 1872 she worked at the role of Mignon with Thomas. She would sing under Sullivan in 1880, Gounod in 1882, and Dvořák in 1885, in performances of their own works. 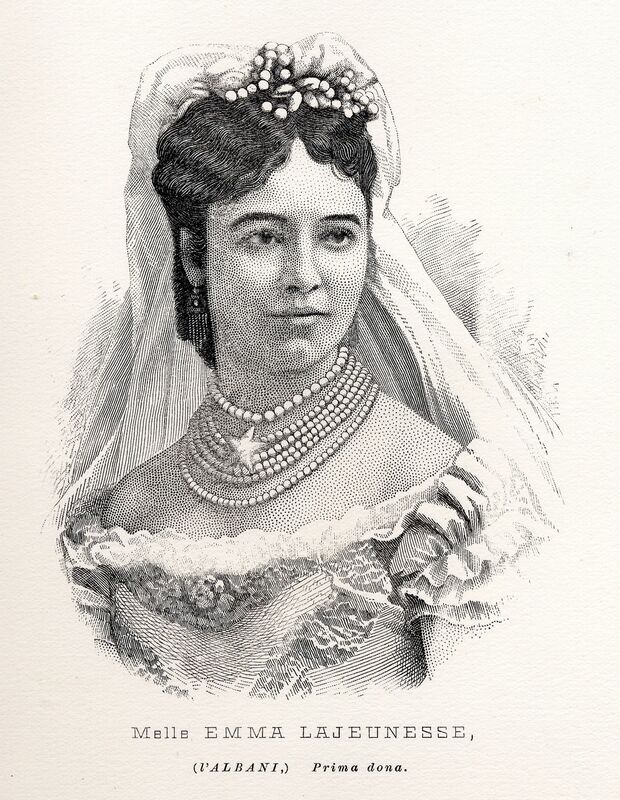 Flotow would write his opera Alma l’incantatrice especially for her in 1878. Gounod would do the same in 1885 with his oratorio Mors et vita. In 1886 Liszt would hear her in London in his oratoria Die legende von der heiligen Elisabeth. In 1893 she would move Brahms to tears with her rendition of the solo from his Deutsches Requiem. These titles illustrate an important facet of Albani’s career: she was a highly skilled singer experienced in oratorio and recital. In England she performed at famous festivals (Leeds, Birmingham, Norwich, Bristol, Liverpool) and at gala events. For instance, at the Crystal Palace in London in 1877, she sang in Handel’s Messiah before an audience of 20,000. From 1876 Albani always had her sister Cornélia by her side. Also a talented pianist, Cornélia had studied in Germany and then had taught music to the children of the royal family of Spain. All her life (she would die not long after Emma), she was her famous sister’s accompanist and companion. Emma married Ernest Gye, the son of the director of the Royal Italian Opera, on 6 Aug. 1878. 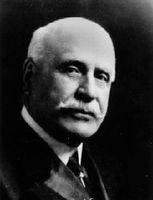 Following his father’s death as a result of an accident, he took over this position from 1878 to 1885. He would become his wife’s impresario. 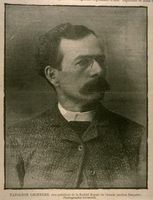 Their son, Ernest Frederick (b. 4 June 1879), would have a prominent diplomatic career and would die in London in 1955. In 1880, while playing Lucia (Lucia di Lammermoor) and Gilda (Rigoletto) at La Scala in Milan, Italy, Albani suffered one of her rare setbacks. Not only was she facing an audience hostile to the presence of non-Italian singers in this theatre, but on that evening she was not in good voice and failed to impress her listeners. The incident did no damage to her reputation, however. Her career even broadened, since she performed in cities she had not previously visited. 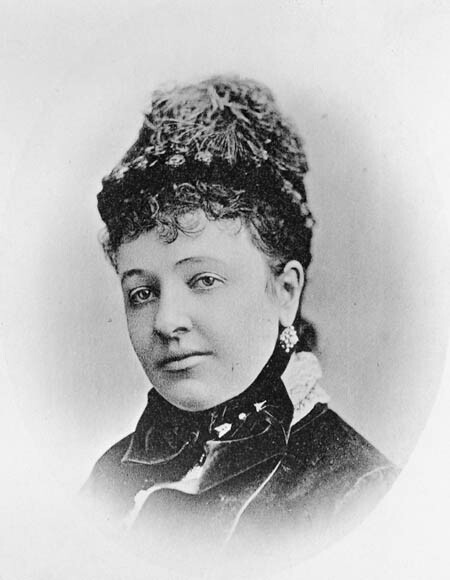 In 1883, under the auspices of impresario James Henry Mapleson, she and Adelina Patti undertook a long tour in the United States during which the two singers shared the limelight. Chicago, Washington, Baltimore, and New York welcomed them. In the same year Emma returned to Canada to give concerts after an absence of some 20 years. When she arrived in Montreal, 10,000 people were waiting to greet her and pay homage to her. It was on this occasion that poet Louis Fréchette* wrote “À Mme Albani (Emma Lajeunesse),” which was published, among other places, in La Patrie on 28 March 1883. 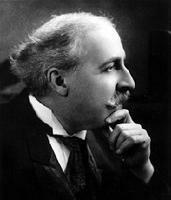 For her first concerts in Montreal, Albani was accompanied by violinist Alfred De Sève. 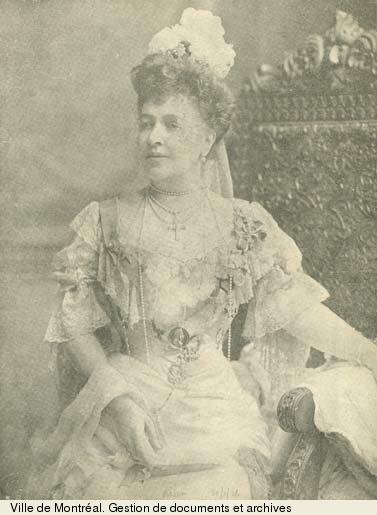 She remained attached to her native country and returned nine times between 1883 and 1906 for tours that took her from one end of Canada to the other. During her first Canadian tours, she only gave recitals. It was not until 1890 that she performed in two complete operas at the Academy of Music in Montreal, Lucia di Lammermoor and Verdi’s La Traviata. That year she lent her support to a benefit concert for Notre-Dame Hospital. At the Victoria Skating Rink an audience of 6,000 cheered her, as well as pianist and composer Salomon Mazurette, violinist Alfred De Sève, and the Montreal City Band under the direction of Ernest Lavigne*. Albani was always generous to charitable organizations. 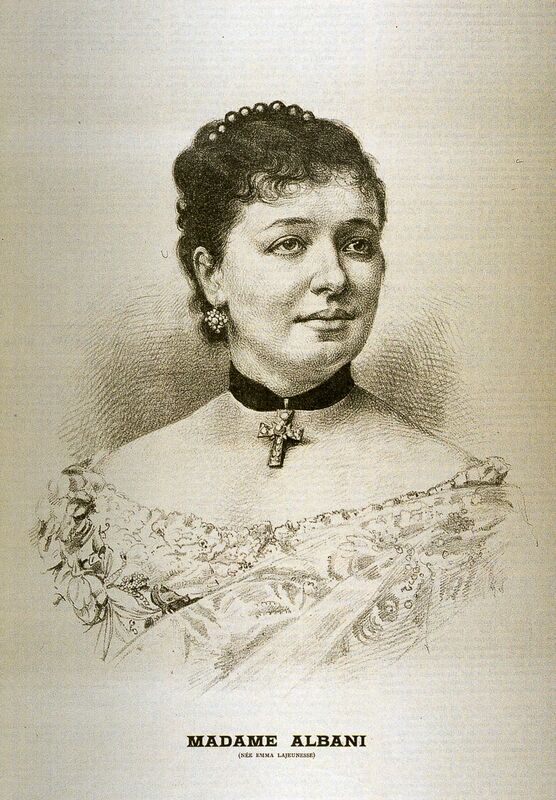 It was in 1890, too, that Albani’s career reached its peak when she gave a spirited performance at the most famous and respected opera house in North America, the Metropolitan Opera in New York. She became the first French Canadian woman to perform in this theatre when she sang the role of Desdemona in Verdi’s Otello, a work that marks an important stage in the history of Italian opera. In July 1891 she also became the first to sing the role at the Royal Italian Opera. This high point was followed by other significant occasions. 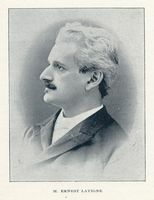 In the course of the 1890s the singer worked alongside famous performers in Europe, such as the brothers Jean and Édouard de Reszke and musicians Pablo de Sarasate and Ignacy Jan Paderewski. Her stage career ended in July 1896 at the Royal Opera House (as the Royal Italian Opera had been renamed in 1892), where, except for four years, she had had top billing since 1872. After her triumph in the role of Isolde (Tristan und Isolde), she made her farewell appearance as Valentine in Meyerbeer’s Les Huguenots. The changing tastes of the theatre’s various directors had obliged her to demonstrate a high degree of flexibility and stylistic diversity. Her eminence as a singer came primarily as a result of her association with this opera house, which was one of the most famous of its day. Albani still sang in recitals. In 1901 she travelled across Canada from Halifax to Vancouver. Wherever she went Canadians acclaimed her as the “queen of song.” Accompanied by a few musicians, she continued to go on tour: South Africa (1898, 1899, 1904), Australia (1898, 1907), Ceylon (Sri Lanka) (1907), India (1907), and New Zealand (1907). In 1906 she made her farewell Canadian tour, accompanied by the young Canadian singer Eva Gauthier*. During the same period, from 1904 to 1907, she is believed to have recorded nine titles, some of which have been remastered and are again available in the 21st century. Her career came to an end before a crowd of 10,000 at the Royal Albert Hall in London on 14 Oct. 1911, the year her memoirs were published in that city under the title Forty years of song. The last years of Albani’s life were clouded by financial difficulties that forced her to teach and occasionally to perform in music halls. Her plight, as a result of the war and bad investments, was such that in 1920 the British government voted her an annual pension of £100 to provide some relief. In 1925, on the initiative of the Australian singer Nellie Melba, a great benefit concert was organized for her. Reports of her penury reached Montreal, where La Presse sponsored a recital on 28 May 1925 in the Théâtre Saint-Denis to raise money for the singer; more than $4,000 was collected. The Canadian and Quebec governments were urged to come to her assistance, but they declined to contribute on the grounds that Albani was more a British subject than a Canadian citizen (she had lived in London since 1872). She was widowed in 1925 and died on 3 April 1930 at her home on Tregunter Road, Kensington (London). Recognized for her work both on stage and in recital, Emma Albani had a repertoire that included 43 roles in 40 Italian, French, and German operas. One of the opera stars of her generation, on an equal footing with her contemporaries Jenny Lind, Adelina Patti, and Nellie Melba, she had a dazzling career for nearly 40 years, winning the admiration of the international musical world. She worked hard and quickly, and with her exceptional voice she used her talent in the service of the music of her day. 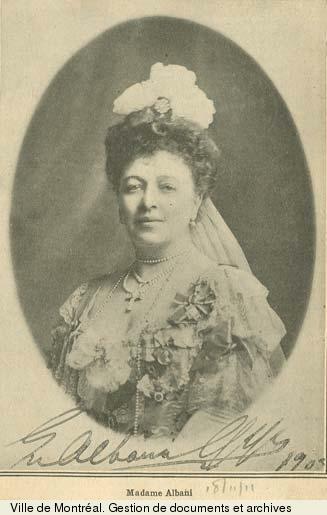 She was the first of a number of Canadian singers to perform on the great opera stages, preparing the way for artists such as Jeanne Maubourg* (Roberval), François-Xavier Mercier, Béatrice La Palme (Issaurel), Pauline Donalda [Lightstone*], and Joseph Rouleau, and more particularly Sarah Fischer, her pupil, and Eva Gauthier, who worked with her. 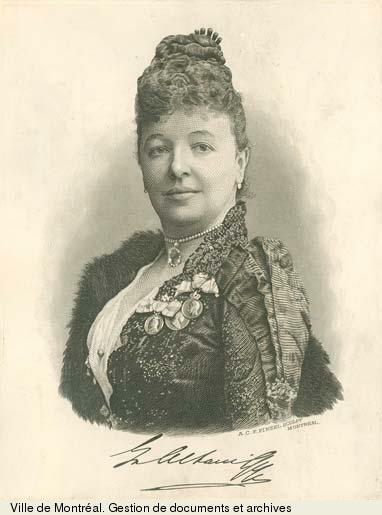 She received many awards, including the gold Beethoven Medal (given by the Royal Philharmonic Society of London) and the medal of honour commemorating Queen Victoria’s jubilee in 1897. In 1925 she was made a Dame Commander of the Order of the British Empire. Emma Lajeunesse is the author of Forty years of song (London, 1911; repr. New York, 1977); Gilles Potvin published a translation under the title Mémoires d’Emma Albani; l’éblouissante carrière de la plus grande cantatrice québécoise (Montréal, 1972). Despite extensive searching, Emma Lajeunesse’s baptismal certificate could not be found. The most reliable document on the subject of her birth, cited in Hélène Charbonneau, L’Albani: sa carrière artistique et triomphale (Montréal, ), is the register of the convent of the Religious of the Sacred Heart, which lists Albani’s birth date as 1 Nov. 1847. A copy of her marriage certificate is in the Fonds Gilles-Potvin cited below. Arch. de la Ville de Chambly, Qué., FA (fonds Albani). Arch. de l’Univ. de Montréal, P 279 (fonds Arthur-Prévost); P 299 (fonds Gilles-Potvin). NA, MG 26, G; J1; MG 30, D178; D207. National Library of Canada (Ottawa), Music div., MUS 10. “Albani,” L’Album musical (Montréal), mars 1883: 17–19. Catalogue of Canadian composers, ed. Helmut Kallmann (2nd ed., Toronto, 1952; repr. St Clair Shores, Mich., 1972), 144. M.-B. Clément, “Albani,” BRH, 55 (1949): 199–210; “Les concerts à Montréal de madame Albani,” BRH, 53 (1947): 364–72. Dictionnaire biographique des musiciens canadiens (2e éd., Lachine, Qué., 1935). Encyclopedia of music in Canada (Kallmann et al.). Romain Gour, “Albani (Emma Lajeunesse), reine du chant (1847–1930),” Qui? (Montréal), 1 (1949–50): 3–20. Helmut Kallmann, A history of music in Canada, 1534–1914 (Toronto and London, 1960; repr. [Toronto], 1987). Napoléon Legendre, Albani (Emma Lajeunesse) (Québec, 1874). Cheryl MacDonald, Emma Albani: Victorian diva (Toronto, 1984). Renée Maheu, “Les grandes voix du Québec,” Cap-aux-Diamants (Québec), no.35 (automne 1993): 10–14. É.-Z. Massicotte, “La famille d’Albani,” BRH, 37 (1931): 660–69, 713. The new Grove dictionary of music and musicians, ed. Stanley Sadie (6th ed., 20v., London, 1980), 1: 196–97; 5: 7. The new Grove dictionary of opera, ed. Stanley Sadie (4v., London and New York, 1992), 1: 49, 1000; 3: 918; 4: 76. 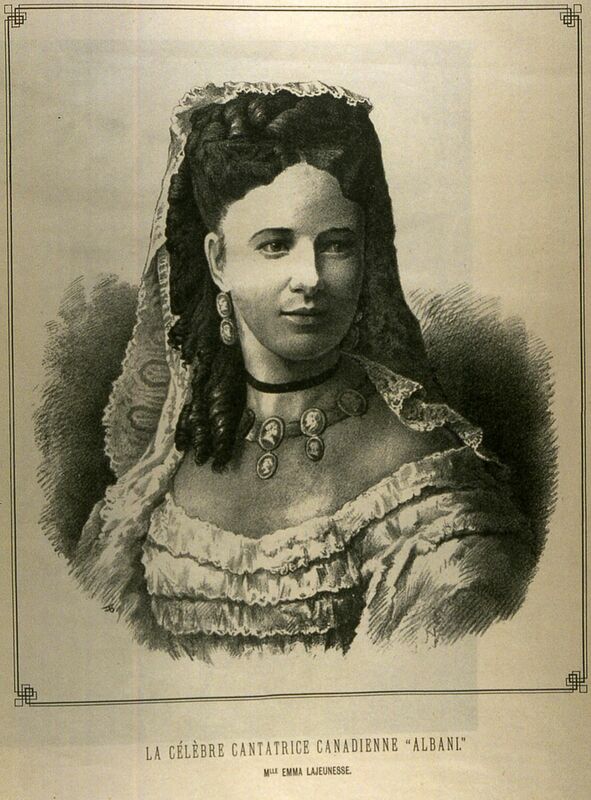 Gilles Potvin, “Emma Albani,” Opera Canada (Toronto), 23 (1982), no.4: 20–21; “Emma Albani (1847–1930),” ARMuQ [Assoc. pour l’Avancement de la Recherche en Musique du Québec], Cahiers (Québec), 7 (1988): 46–64; “Emma Albani dans I Puritani au siècle dernier: un succès pyramidal et des déluges de fleurs,” Aria (Montréal) 10 (1987), no.1: 7. Pierre Vachon, Emma Albani (Montréal, 2000). Pierre Vachon, “LAJEUNESSE, EMMA (Marie-Louise-Cécile-Emma) (Gye), known as Emma Albani,” in Dictionary of Canadian Biography, vol. 15, University of Toronto/Université Laval, 2003–, accessed April 26, 2019, http://www.biographi.ca/en/bio/lajeunesse_emma_15E.html.